I am delighted to announce my work has been selected for an exhibition at The Courthouse Gallery, Ennistymon, showing alongside Isabelle Gaborit and Kathryn Kelly. With my camera I paint on the canvas that is my life. A life exploring the edge. The edge of land and sea, the edge of my mind where life becomes abstract and reality is challenged, the edge of the reach of my eyes. Photography to me is listening, listening is presence. I continuously find myself drawn towards the ever changeable rhythm and infinite expressions of water where separation between the outer and inner landscapes seemingly ceases to exist. In nature I remember, I am nature too. Black and white is my preferred form due to its naked simplicity which appears to hold quiet stories of its own, it opens the space and invite the viewer in to fill the image with their own colours and imagination, the story that lives in between the lines. Will be lovely to see you in Co. Clare, Ireland for the preview of my upcoming exhibition the 30th of June 7pm – 9pm. “Storm & Still” is on a little tour de Ireland. 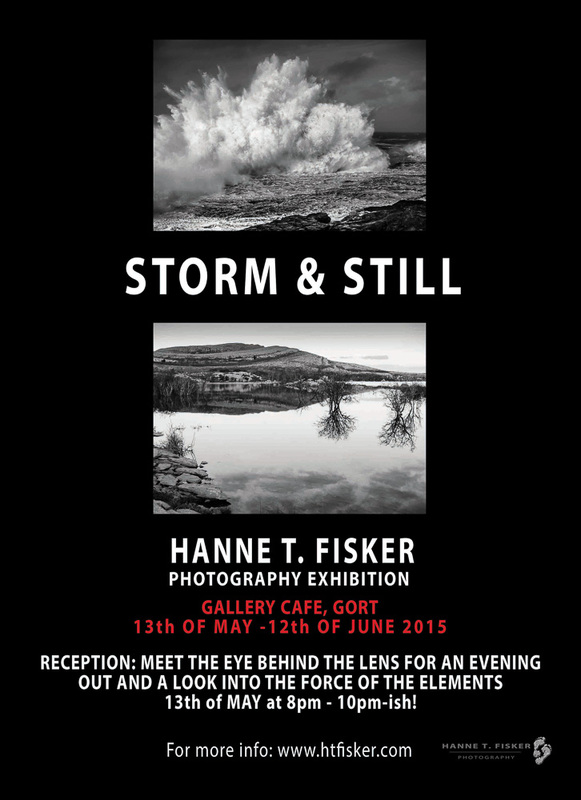 A new exhibition is on the horizon from 13th of May – 12th of June 2015 at the wonderful Gallery Cafe, Gort in Co. Galway. I will have a reception Wednesday the 13th of May from 8pm – 10pm-ish and will love to see you there, please do call in. This exhibition will have a few new photographs never shown before. Each photograph holds a story, a sensation, a feeling, a way of being…. I will be happy to share some of these stories with you Wednesday the 13th of May 2015. P.S.There’ll be a glass of wine or non-alcoholic fluid for you. Furthermore, should you arrive hungry the kitchen is open until 9pm. If not ‘live’ maybe I’ll see you here? www.hannetfisker.com – Updates and News on creative projects & events I’m involved in. 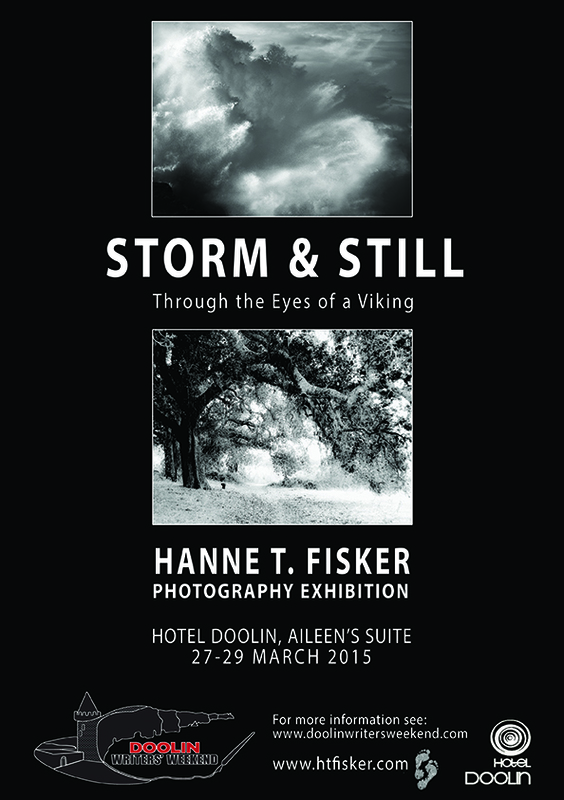 During Doolin Writers Weekend the 27th – 29th of March 2015 and the following week until Friday the 3rd of April 2015 I will have my first ever photography exhibition at Hotel Doolin with special selected photos from my many wanderings around the world. Only a few of the photos at the exhibition is up on my blog, a blog which is not solely for show-casing my work, but more a creative play-ground for me to freely explore and play with different expressions. Therefore most of the pictures for the photography exhibition will see the day of light for the first time at the exhibition. Furthermore, it will be photos in B&W only, some of them will be straight forward, some quite abstract. All photos will be presented in white locally handmade frames by Vincent Wall Framing Studio, Ennistymon. Photography is to me a strange sense of an invitation from the landscape slowly revealing more and more of itself for each footstep I take. I’m aspiring to let the purity of the moment transpire into every photo; revealing the visible and the invisible in the space between spaces through a raw simplicity and an untamed wildness in an almost physical felt stillness. Sometimes a photo calls out words and a poem lands gently at its feet. All photographs are for sale at the Exhibition. If you’ve been to the exhibition and you wish to place an order of a different size please send me an email with your request. All photographs are limited edition.